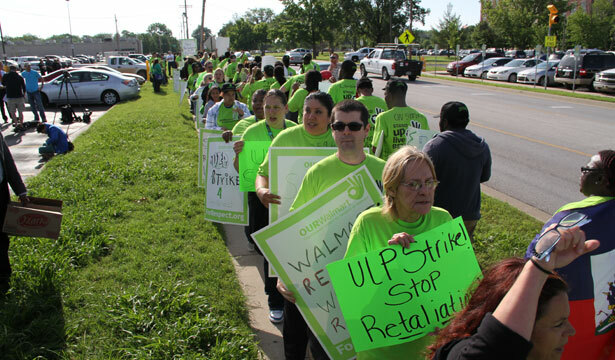 A Walmart pep rally and a union-backed protest took place some fifty feet apart at Walmart’s Bentonville "home office." Bentonville, Arkansas—Competing chants pierced the air, and punctuated one another, as a Walmart pep rally and a union-backed protest took place some fifty feet apart this afternoon. As successive busses drove up to drop off more company-invited Walmart workers under the Home Office awning, managers led the blue-shirted workers in cheering for their arriving co-workers and chanting the letters of the company’s name. The protesters across the lot from them kept up their slow-paced song, sometimes punctuated with “Whose Walmart? OUR Walmart!” and “Stand Up! Live Better!” Some hoisted flags and signs identifying their home countries, and giant cut-outs spelling out “1,239 KILLED,” the combined death toll from a building collapse and a fire in buildings where Walmart apparel has been produced. The “What’s that spell?” chant continued as Bangladesh labor leader Kalpona Akter took the mic on the sidewalk to call for Walmart to join a binding building safety agreement, and as protesting workers read Bible verses in four languages. Then a half-dozen striking Walmart employees walked into the middle of the parking lot, where they were met by Walmart security and local police. As co-workers sang or chanted on either side of the lot, Seattle striker Preston Johnson presented a security officer with a three-foot-tall list of the retailers who’ve signed onto the labor-backed Accord on Fire and Building Safety in Bangladesh; it included a dotted line at the bottom for Walmart CEO Mike Duke, who hasn’t. “1,239 folks have died because of factories that were unsafe,” said Johnson, “and we found out that Walmart is one of the companies that had workers making clothes there.” As in past Bentonville confrontations, the Walmart security officer told the workers that human resources staff were available to meet with them individually, but not collectively; the workers declined and marched away. As I’ve reported, striking workers from the union-backed group Organization United for Respect at Walmart (OUR Walmart) have been in Bentonville since Saturday, following a series of Freedom Ride–inspired caravans that made stops in some twenty cities. The workers have framed their work stoppage as a protest of retaliation by Walmart against workers who organized for better wages and working conditions. Organizers say at least a hundred workers are participating in the current strike, which is substantially smaller than last fall’s Black Friday walkout, but significantly longer: workers began walking off the job eight days ago, and have pledged to stay out on strike at least through the company’s shareholder meeting on Friday. Walmart stated immediately after the November fire that it could not confirm whether it had used the Tazreen factory; after photos were released showing its apparel there, Walmart announced that it had cut off the factory prior to the fire, and blamed the presence of Walmart goods there on a rogue supplier that it said had continued filing orders without Walmart’s authorization, and was thus being terminated. Subsequent stories in Bloomberg and The New York Times reported that at least three Walmart suppliers were sourcing goods from the factory in 2012, and that Walmart played a key role in vetoing a 2011 proposal under which Western retailers would have paid for the cost of safety improvements in Bangladesh factories. Similarly, after The New York Times reported that documents from 2012 showed Walmart apparel had been produced in the Rana Plaza building, Walmart announced that it was terminating a supplier based on “unauthorized subcontracting”; that supplier blamed a “rogue employee.” Since the Rana Plaza disaster, Walmart has drawn a new round of protests and scrutiny for declining to join the labor-backed Accord on Fire and Building Safety in Bangladesh. That deal is backed by the global union federations IndustriALL and UNI, and by a battery of European brands, as well as Abercrombie & Fitch and the parent company of Calvin Klein and Tommy Hilfiger. Along with at least one OUR Walmart member, Akter will be among the Walmart critics presenting resolutions when the shareholders gather at the University of Arkansas’ Bud Walton Arena on Friday. The motion to be presented by Akter would allow any group of shareholders who together own a tenth of the company’s shares to instigate a special shareholder meeting to address corporate governance issues. Like three other shareholder resolutions being presented Friday, the proposal is supported by the corporate governance group Institutional Shareholder Services, and opposed by Walmart. Walmart hasn’t been ignoring the planned protests. On Monday, an Arkansas Circuit Court granted a temporary restraining order, requested by the company, prohibiting activists from the United Food & Commercial Workers union or OUR Walmart—other than Walmart employees—from entering Walmart property in Arkansas for “activities such as picketing, patrolling, parading, demonstrations, ‘flash mobs,’ handbilling, solicitation, and manager confrontations” In an e-mailed statement, National Organization of Women President Terry O’Neill called the order “Walmart’s latest attempt to silence the voices that are calling for real change at the nation’s largest employer.” The OUR Walmart campaign said that the order would not affect its protest plans; during today’s action, organizers repeatedly reminded protesters to stay on the sidewalk. Walmart’s Lundberg also noted that the company was bringing “14,000 associates from around the globe” to Arkansas “to participate in activities throughout the week that highlight and recognize the accomplishments of the 2.2 million associates around the world and what they do to take care of their customers.” Those activities include free concerts last night and tonight—headlined by Elton John and country singer Luke Bryan, respectively—for the employees the company’s flown into town this week, and those who live in the area.